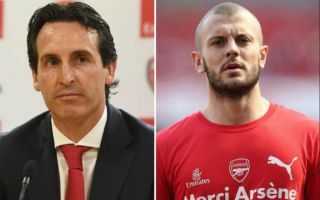 Arsenal manager Unai Emery reportedly told Jack Wilshere he was not good enough for his team before allowing him to leave on a free transfer to West Ham. This big claim comes from a report in the Telegraph, explaining the differences in how Arsenal and Manchester United have dealt with parting ways with legendary former managers Arsene Wenger and Sir Alex Ferguson. While Ferguson’s initial successor David Moyes seemed somewhat overawed by the situation he inherited at United, Emery has been bold and made some big decisions. Among the biggest early decisions was axing Wilshere, who was allowed to leave at the end of his contract and join West Ham. The England international was a big favourite among Arsenal fans after coming through the club’s academy and suffering plenty of bad luck with injuries down the years. Emery, however, was supposedly not that big a fan of the player and was brave enough to tell him as much, according to the Telegraph. While fans may not have been too pleased with the move at the time, Emery may feel vindicated as Wilshere has not done a great deal at West Ham, while Lucas Torreira has done a superb job of replacing him in the Gunners’ midfield.